World Cup 2010 Tech: Tired of the Vuvuzelas? Filter Them Out! 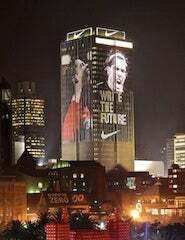 In celebration of the World Cup, Nike has installed a huge LED screen onto one of South Africa's skyscrapers. The giant screen, which now dominates Johannesburg's 138 meter high Southern Life Centre, displays content from a whole host of social networks, and is part of the Nike's "Write The Future" ad campaign. The interactive and ever-connected screen pulls in its content from the likes of Twitter and Facebook. It also collects content from numerous international social networking sites, including the Chinese social network QQ and South African offering Mxitt. When visiting one of the aforementioned sites, soccer fans can input a short message of encouragement, up to 57 characters in length. Once submitted Nike then selects 100 of the user-generated messages to display on the 44-meter-high-by-42-meter-wide screen each night. You can submit your own messages of World Cup support on Facebook, or you can get involved by adding the hashtag #NikeFuture to your tweets.